Adonijah, another of David’s spoiled sons, was David’s fourth son, his mother being Haggith (1 Samuel 3:2-4). Apparently, David’s first three sons died, leaving Adonijah, traditionally, as the heir apparent to the throne of Israel. Thus, he began acting as thus, gathering support from Joab and Abiathar, and parading around in chariots. He held a great feast, in the middle of which Solomon was proclaimed king by David, who had found out about Adonijah’s tactics to set himself up to be king. It took 7 years to build God’s temple. Cedar lined the interior walls. The ark of the covenant was placed in the inner sanctuary, along with a pair of cherubim made of olive wood and overlaid with gold. The entire inner and outer rooms of the temple was covered in gold layering. 12) Solomon built the temple to dedicate to the Lord to have a place for burning fragrant incense before him, for setting out the consecrated bread regularly, and for making burnt offerings every morning and evening, on the Sabbaths and New Moons, and at the appointed feasts of the Lord. The temple had to be great because God is great. It as meant as a place to burn sacrifices to God. 13) Personal Question. My answer: I love how Solomon honors God with the best of the best. He takes his time to get it right. He makes everything perfect for a perfect God. 14) Personal Question. 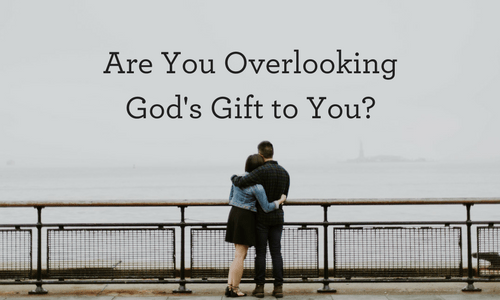 My answer: By using God’s talents for God’s glory and not your own and always giving the glory and credit to God, not yourself. I need to better reflect God in my work. I love the detail the Bible provides of what the temple looks like since we have no pictures. Awesome and splendid! Special attention was given to the Holy of Holies or Most Holy place. It was a 30-foot (10 meter) cube, completely overlaid with gold. It also had two large sculptures of cherubim (15-foot or 5 meters in height), which were overlaid with gold. There were gold chains across the veil separating the Holy Place from the Most Holy Place. “The gold chains, stretched across the front of the inner sanctuary, served to strengthen the concept of the inaccessibility of this Most Holy Place” (Patterson and Austel). The two cherubim inside the Most Holy Place faced the entrance to this inner room, so as soon as the High Priest entered, he saw these giant guardians of the presence of God facing him. There was gold everywhere in the temple. The walls were covered with gold (1 Kings 6:20-22), the floor was covered with gold (1 Kings 6:30) and gold was hammered into the carvings on the doors (1 Kings 6:32). The tabernacle had woven designs of cherubim on the inner covering. It was the court of the priests where the altar and laver were set and sacrifice was conducted. Outside it was the great court, where the people came to pray. Outside it was the court of the women, and outside that was the court of the Gentiles. Under the Old Covenant, the temple was not for the people of Israel. It was only for the priests to meet with God on behalf of the people. The people gathered and worshipped in the outer courtyard. Four hundred and eighty years after God brought the Israelites out of Egypt, Solomon began the building of God’s temple. As the building of the temple was taking place, God came to Solomon and told him to keep His decrees, carry out His laws, regulations, and commands, and God would fulfill all the promises He gave to David through him. 9) God asked Abraham to sacrifice his son, Isaac. David spared Saul’s life. Solomon builds God’s temple here. Jesus is sacrificed here, just on the other side of Mount Moriah. These are all places God spared people, which is what the temple does. It spares people of their sins once the atoning sacrifice is made. The final atoning sacrifice was made with Jesus’ crucifixion. 10) God came to Solomon and told him to keep His decrees, carry out His laws, regulations, and commands, and God would fulfill all the promises He gave to David through him. God also promised to live among the Israelites and not abandon them. God is omniscient so He knows the mistakes Solomon is about to make (idol worship, marrying foreign wives, building altars to foreign gods, etc). God is trying to warn Solomon before he chooses to make those mistakes. 11) Personal Question. My answer: He reminds me of my blessings in subtle ways like the beautiful sunrise or sunset. He places people in my life I can touch in small ways, like co-workers. He keeps my in His word with BSF. He reminds me all things are from Him. I love how God blesses and then He reminds to follow Him always. Then it’s just a matter of if we listen or not. This time reference gives us dates for the Bible: The reign of Solomon began in 971 BC and ended at 913 BC (the temple was begun in 967 BC). This means that the Exodus took place in 1447 BC. It took probably about three years to prepare timber from Lebanon for use in building. If Solomon began the construction of the temple in the fourth year of his reign, he probably started organizing the construction in the very first year of his reign. Yet the work was carefully organized and planned even before Solomon became king. 1 Chronicles 28:11-12 tells us, Then David gave his son Solomon the plans for the vestibule, its houses, its treasuries, its upper chambers, its inner chambers, and the place of the mercy seat; and the plans for all that he had by the Spirit, of the courts of the house of the LORD, of all the chambers all around, of the treasuries of the house of God, and of the treasuries for the dedicated things. The writer of 1 Kings never tells us exactly where the temple was built, but the writer of 2 Chronicles tells us that it was built on Mount Moriah (2 Chronicles 3:1), the same place where Abraham went to sacrifice Isaac and Jesus would be crucified (on another part of the hill). 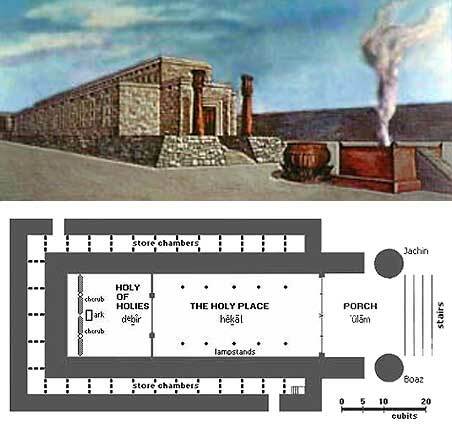 The temple proper (the house which King Solomon built), divided into two rooms (the holy place and the most holy place). The vestibule or entrance hall on the east side of the temple proper (the vestibule in front of the sanctuary). It was thirty feet (10 meters) wide and fifteen feet (5 meters) deep, and the same height as the temple proper. The three-storied side chambers (chambers all around) which surrounded the temple proper on the north, south, and west sides. The temple proper was approximately 90 feet (30 meters) long, 30 feet (10 meters) wide, and 45 feet (15 meters) high. This was not especially large as ancient temples go, but the glory of Israel’s temple was not in its size. Allowing for the outside storage rooms, the vestibule, and the estimated thickness of the walls, the total size of the structure was perhaps 110 feet, 37 meters long and 75 feet, 25 meters wide. The dimensions of the temple also tell us that it was built on the same basic design as the tabernacle, but twice as large. This means that Solomon meant the temple to be a continuation of the tabernacle. The stones used to build the temple were all cut and prepared at another site. The stones were only assembled at the building site of the temple. The temple had to be built with human labor. God did not and would not send a team of angels to build the temple. Yet Solomon did not want the sound of man’s work to dominate the site of the temple. He wanted to communicate, as much as possible, that the temple was of God and not of man. Often the greatest work in the Kingdom of God happens quietly. Yet the building site of the temple was only quiet because there was a lot of noise and diligent work at the quarry. God promised an obedient Solomon that he would reign and be blessed, fulfilling the promises God made to David about his reign (2 Samuel 7:5-16). He also promised that His special presence would remain among Israel as a nation. There was nothing particularly new in this promise. These are essentially the same promises of the Old Covenant made to Israel at Sinai. But this was an important reminder and renewal of previous promises. God was careful not to say that He would live in the temple the way pagans thought their gods lived in temples. He would dwell among the children of Israel. The temple was a special place for man to meet with God. The King of Tyre was pleased and praised God. He had the cedar trees cut down and floated he logs down by sea. He took payment in the form of food for his royal household. This relationship went on for many years, with Hiriam giving Solomon all the timber he wanted in exchange for food. They made a treaty together. 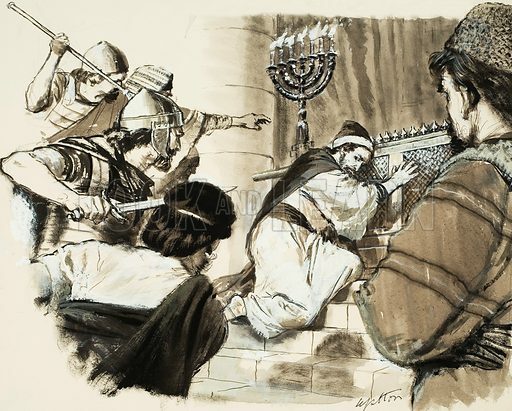 The building of God’s temple began in earnest, with 10,000 men a month going to Lebanon and 70,000 men cutting stone and 3300 foremen to supervise. They removed stone for the foundation of the temple, and both the stone and the timber were prepared. 6) Solomon got all the timber he needed in exchange for food from the King of Tyre. He coordinated the wood cutting and the stonecutters and had the wood and stone prepared. King Tyre also sent Huram-Abi, a man skilled in gold, silver, bronze, iron, stone, wood, and engraving to help with the design. 7) Personal Question. My answer: I had no thoughts except that this was how it was done in ancient times. I didn’t bat an eye. 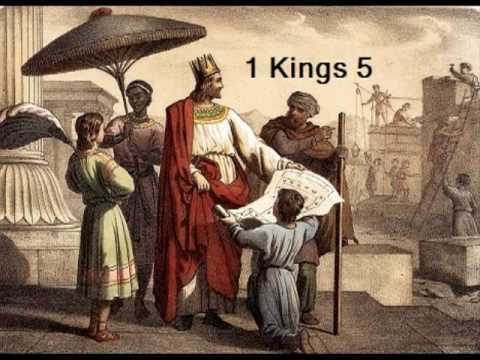 1 Kings 9 tells us Solomon used only foreigners for the job. My study bible tells me that this use of foreigners creates dissension in the kingdom, especially amongst the northern tribes. 8 ) Personal Question. My answer: I happen to believe nothing is greater than my ability as long as I put my mind to it. I do want to write more novels. I do want to get promoted at work. I do want to not piss people off. In that respect, God has given me the desire to grow professionally and personally in the way I deal with other people. All things are possible with God and with Him leading, it all will happen. Solomon takes the ball and runs with it here, getting everything prepared to perform this massive undertaking of building God’s temple (and his personal palace as well). He knows it’s God’s will, and everything falls into place to make it happen — just like He does in our lives when it’s His will and not our own. Solomon, in his God-given wisdom, continued the friendly relationship between Israel and Lebanon, each helping each other in a win/win relationship. Solomon employed his workforce wisely. Solomon delegated responsibility to men like Adoniram. Instead of making the Israelites work constantly away from Israel and home, Solomon worked them in shifts. Solomon used high-quality materials even in the foundation where the stones could not be seen. This show us how we should work for God: not for appearances. God works in us not for appearances. God builds the church not for appearances either, but for deep, foundational work. “Some suppose that these Gebalites were the inhabitants of Byblos, at the foot of Mount Libanus, northward of Sidon, on the coast of the Mediterranean Sea” (Clarke). 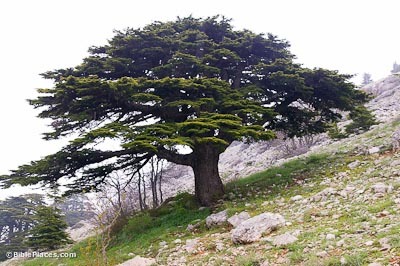 Solomon uses the cedars of Lebanon from the King of Tyre for God’s temple. 3) He planned to build God’s temple. 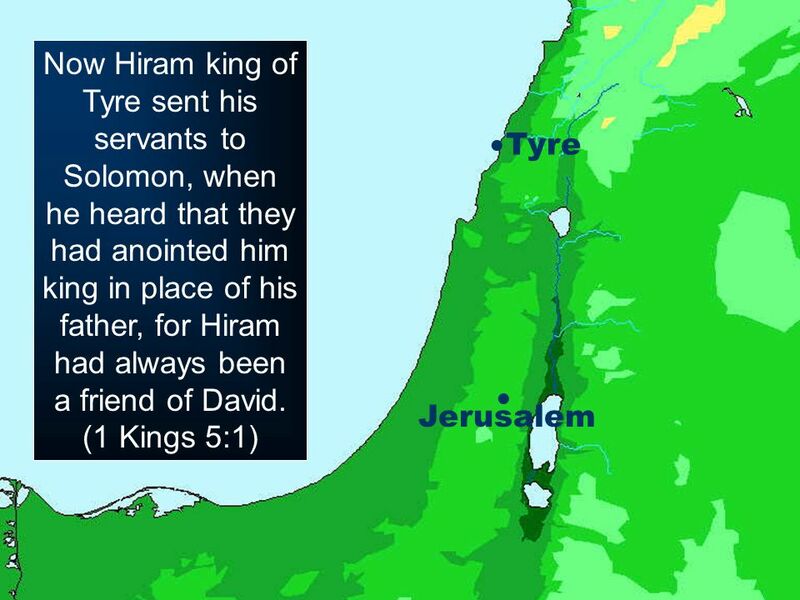 Solomon knew the King of Tyre was his friend so he asked for wood for the temple as well as the men to fell the timber. 4) The King of Tyre has always been on friendly terms with David. David had already prepared a lot of the materials. God has given Solomon rest from wars, Satan, and natural disasters, so he’ll have the time and the resources to build the temple and pay the Sidonians for their skill. The envoy arrived at the perfect time. 5) Personal Question. My answer: God has given me this work on this forum to do, as well as my current position. I work hard at both to bring the most value. He’s inviting me to trust Him to His timing in this work. I love how God does include the Gentiles in the building of the temple. It shows God’s foresight of His overall plan for the world. Of course, Solomon did not build a temple for a name but for a living God. This is a good example of avoiding direct mention of the name of God in Hebrew writing and speaking. They did this out of reverence to God. “Solomon also used this phrase because he wanted to explain that he didn’t think the temple would be the house of God in the way pagans thought. Pagan temples might be intended for the actual residence of the god, but Solomon knew that the heaven of heavens could not contain God, much less this temple which he was about to build.” (Maclaren). 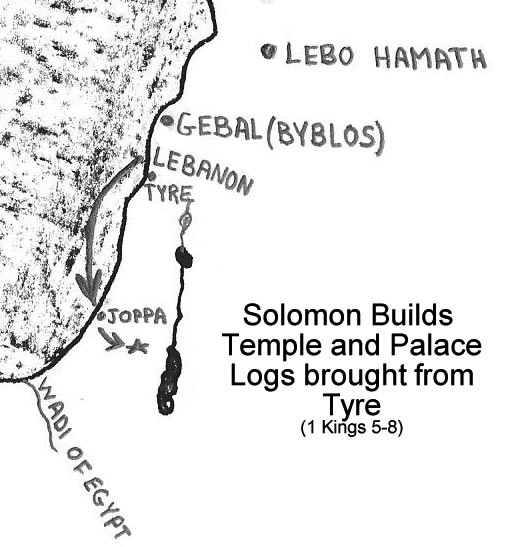 The cedar trees of Lebanon were legendary for their excellent timber, showing how Solomon wanted to build the temple out of the best materials possible.